HOME TO BE BUILT. THE VENICE FEATURES A WELCOMING FOYER THAT LEADS INTO A LIVING ROOM. NEST THERMOSTAT AND WI-FI ENABLED GARAGE DOOR OPENER INCLUDED! THROUGH THE HALLWAY, THE FAMILY ROOM IS LARGE ENOUGH TO ACCOMMODATE A GROUP OF ANY SIZE. THE KITCHEN FLOWS FROM THE FAMILY ROOM & BOASTS A MORNING ROOM, PANTRY, AMPLE CABINETRY & A GOURMET ISLAND. A CONVENIENT MUDROOM PROVIDES EASY ACCESS TO THE TWO-CAR GARAGE. UPSTAIRS, FOUR SPACIOUS BEDROOMS AWAIT WITH TWO BATHS, INCLUDING A LARGE OWNER’S BATHROOM WITH DUAL VANITY. FOR A SPA-LIKE EXPERIENCE, UPGRADE THE OWNER’S BATH TO INCLUDE A SOAKING OR JET TUB. THE LAUNDRY ROOM IS DISCREETLY TUCKED AWAY ON THE UPPER LEVEL. OPT FINISHED 3RD FLOOR FOR EXTRA LIVING & ENTERTAINING SPACE! 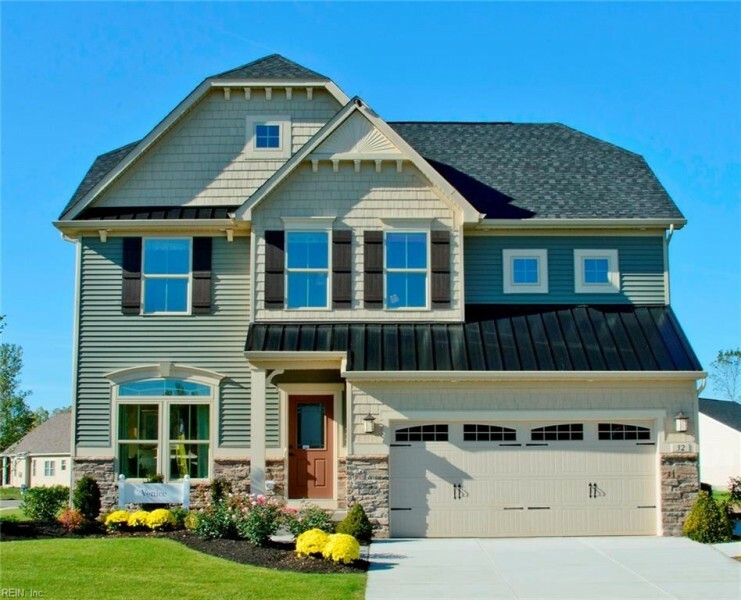 GET MORE FOR YOUR MONEY AT PATRIOTS WALKE – FEATURING NEW LUXURY HOMES ON PRIVATE LOTS WITH SHORT COMMUTES TO I-64, I-264, I-664. SHORT COMMUTES TO NORFOLK NAVAL STATION, PORTSMOUTH NAVAL HOSPITAL & NEWPORT NEWS SHIPYARD. ENJOY LARGE, PRIVATE LOTS. Ready to visit MM Venice at Patriot's Walke? Request a free property tour! Send me more information about the listing at MM Venice at Patriot's Walke, Suffolk, VA 23434, MLS# 10240131. This 4 bedroom, 3 bathroom home located at MM Venice at Patriot's Walke, Suffolk, VA 23434 has approximately 2,225 square feet. It is currently listed for $307,990 and has a price per sqft of $13,842. This home is currently Active under the MLS#: 10240131. This listing is provided by Rose & Womble Realty Company. MM Venice at Patriot's Walke , Suffolk was built in 2019. It has Garage Att 2 Car, 2 Space, Covered, Off Street, Driveway Spc parking.The kitchen includes Dishwasher, Dryer Hookup, Energy Star Appliance(s), Microwave, Range, Washer Hookup. MM Venice at Patriot's Walke is part of the Patriots Walke neighborhood located in 23434.